You may have watched hundreds of episodes of The Simpsons (and its sister show Futurama) without ever realizing that cleverly embedded in many plots are subtle references to mathematics, ranging from well-known equations to cutting-edge theorems and conjectures. That they exist, Simon Singh reveals, underscores the brilliance of the shows’ writers, many of whom have advanced degrees in mathematics in addition to their unparalleled sense of humor. While recounting memorable episodes such as “Bart the Genius” and “Homer3,” Singh weaves in mathematical stories that explore everything from p to Mersenne primes, Euler’s equation to the unsolved riddle of P v. NP; from perfect numbers to narcissistic numbers, infinity to even bigger infinities, and much more. 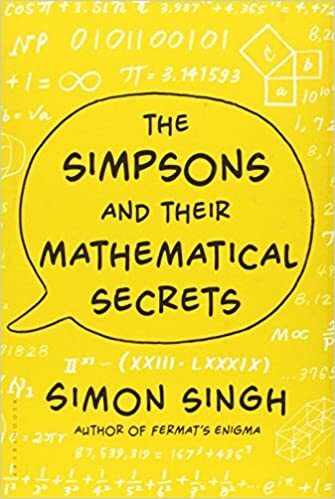 Along the way, Singh meets members of The Simpsons’ brilliant writing team—among them David X. Cohen, Al Jean, Jeff Westbrook, and Mike Reiss—whose love of arcane mathematics becomes clear as they reveal the stories behind the episodes. With wit and clarity, displaying a true fan’s zeal, and replete with images from the shows, photographs of the writers, and diagrams and proofs, The Simpsons and Their Mathematical Secrets offers an entirely new insight into the most successful show in television history. Simon Singh is a British author who has specialised in writing about mathematical and scientific topics in an accessible manner. His written works include Fermat’s Last Theorem (in the United States titled Fermat’s Enigma: The Epic Quest to Solve the World’s Greatest Mathematical Problem),The Code Book (about cryptography and its history), Big Bang (about the Big Bang theory and the origins of the universe), Trick or Treatment? Alternative Medicine on Trial (about complementary and alternative medicine) and The Simpsons and Their Mathematical Secrets (about mathematical ideas and theorems hidden in episodes of The Simpsons and Futurama). Singh has also produced documentaries and works for television to accompany his books, is a trustee of NESTA, the National Museum of Science and Industry and co-founded the Undergraduate Ambassadors Scheme.